The urban transportation system in Qianhai provides both fast and slow means of transportation with a strong emphasis on public transportation, promoting greener, cleaner and more environmentally friendly means of transportation. The plan is to build five intercity railways such as Hong Kong-Shenzhen Western Express Railway, Guangzhou-Dongguan-Shenzhen, Shenzhen-Huizhou, Shenzhen-Dongguan, and Shenzhen-Zhuhai as well as seven intra-city railways such as Lines 1, 5, 9, 11, Guangming and Pingshan. 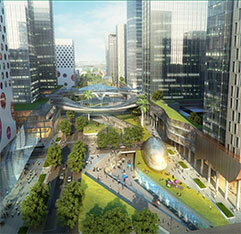 This will create a one-hour traffic circle within the Pearl River Delta and a half-hour traffic circle with Hong Kong. The urban planning will provide convenience to pedestrians so they can walk to the harbour under the shade of trees. Bike lanes and recreational areas that are within 200 meters of the walking trail will also be provided so that commuters enjoy seamless transition to railway and public transport stations. With planned land use covering 14.92 square kilometres and a total construction area covering 26 million square miles, Qianhai is expected to create 800,000 jobs and provide shelter for 300,000 residents. Qianhai will try to strike the delicate balance between local land use and public space, finding the appropriate development density. We will promote the integrated use of land and multifaceted building functions to create a diversified urban environment. We will also advocate a unit development model that is based on the urban complex. 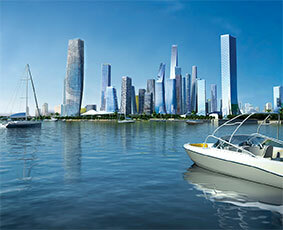 Qianhai will be developed into 22 units. The development will centre on areas with railways and public transport stations. 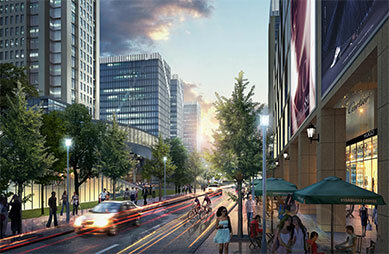 Each unit will have office space, commercial space, residential areas, and recreational and entertainment areas. 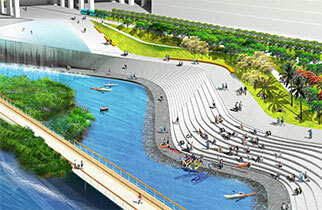 This design will reduce the time spent on commuting to work and elevate the city’s vitality. Qianhai will be much more than one of the two future city centres – it will be a functional area for the extensive development of modern service industries. Its focus will be on modern service industries such as finance, modern logistics, information services, technology services and other professional services. The Gui Wan area will focus on developing modern service industries such as finance, trade and accounting, attracting corporations to set up their headquarters in that area. 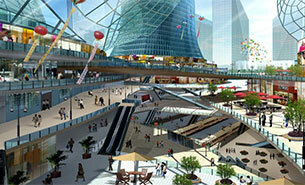 The Li Wan area will focus on developing modern service industries such as technology and information. The Ma Wan area will focus on modern service industries such as modern logistics, aviation services, supply chain management and financial industry. The river, the bay and the sea are core natural components of Qianhai. There are plans to build three finger-shaped corridors and one that is ring-shaped to connect the ‘three areas and two belts’ and create a spectacular development pattern. The coastal recreation zone is a hybrid of nature, scenery and culture that provides a high-quality coastal public area for activity and shopping. To adhere to the principles of prioritising public transport and low-impact development, determine the best usage of resources and new energy scientifically, adopt highly adaptable and economically-sound green technologies, create a cutting-edge service infrastructure, and explore low-carbon ecological urban planning and development in high-density areas. 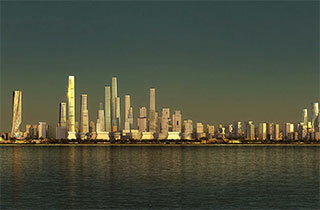 To take full advantage of the natural environment and coastal shore to create a dynamic iconic and modern city image, and to efficiently utilise landscape, promote public transport and encourage walking and mixed usage of public space to build a human-centred green working and living environment. This strategy aspires to leave a spiritual inheritance of an international coastal city, following on the concept of developing an ecologically-sound, healthy and sustainable city that integrates its industries. Qianhai will become an internationally competitive regional modern service centre and a contemporary coastal urban district. To establish an effective scientific industrial development system and build a platform that features leading industries, efficient resource allocation and comprehensive public services. Also, to adhere to the simultaneous promotion of sustainable industrial and urban development, attracting talent, information, capital and other key factors to promote harmonious growth between people, society, enterprises and the environment.